December 2015 ended with a bang â€“ with higher levels of activity and demand than is typical for December. This of course would lead most to believe that if December was that strong, then surely January would follow suit.Â Â Ever the contrarian, the market started 2016 with the whimper typical of most Januaries.Â This left prognosticators grasping at straws for trends.Â After so many years of uncertainty, one can appreciate the need for certainties.Â But the fact is, 2016 is still in its infancy and it will be the end of February before any definitive trends appear. Before you toss this article in the trash (you werenâ€™t really going to, were you?) there are a few things we can examine. As the real estate market is in essence a study in supply and demand, it is always worthwhile to take a glance at those two components. Of these two factors, letâ€™s begin with supply – the slower moving of the two and therefore perhaps the easier one to examine.Â Supply also can tell us a lot about the health of the market; is supply being consumed rapidly or is it accumulating? 2016 started with a 10% drop in inventory compared to 2015 but â€“ like most statements â€“ this one has a slight qualifier.Â As weâ€™ve mentioned in previous articles, a more concise evaluation of the supply situation appears when you look at specific price points.Â Not surprisingly, supply is most constrained and likely to continue to be so, at the 300K and under range.Â The reason is really two-fold.Â Builders, whom are building at higher rates than we have seen in years, are largely building single family homes in the 400K+ range.Â The sheer cost of the land and commodities essentially make it prohibitive to build single family homes for less.Â Additionally, as the values of homes continue their gentle climb upwards â€“ the lower price ranges begin to further erode.Â Even at a moderate increase of 4-6% yearly, a $275,000 home exceeds $300,000 in just a couple of years.Â Add to that the fact that FHA financing (the most commonly used financing in the valley) currently caps out at $271,050 â€“ putting the largest pool of buyers in the smallest group of available sellers. Luxury home sellers will be pleased to see that we have not seen a large increase in new listings at elevated price points. 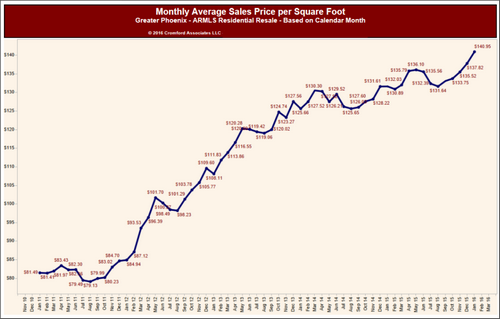 Only $1.5M to $2M increased by 10% and all other ranges above $800K are down year over year. Entry level buyers will be disappointed that the supply situation below $175K is just going from bad to worse. The middle of the market between $300K and $800K is where the increases are concentrated – there are at least 10% more new listings here than last year in each of the price ranges. Here we see clearly that luxury home buyers have quite a bit more choice than last year. In fact from $400,000 upwards there are more homes for sale. Yet the overall supply is down because supply below $275,000 is so weak. Last year there was already a shortage of affordable homes, so the situation has worsened for buyers, which is obviously good news for sellers. This leads us to the more fickle component â€“ demand.Â If this year follows last yearâ€™s trend, the spring buying season will bring a leap in demand.Â We certainly felt the first signs of that after MLK day.Â If this continues, we can expect 2016 to be a sellerâ€™s market for most price points up to a million.Â Even if demand should falter, the 300K and under market will still retain a strong seller advantage.Â Add to this the fact that the rental supply also continues to remain very low pushing rental rates upwards. A certain group of renters, finding no relief in rental rates, may look to become purchasers.Â Additionally, the boomerang buyers (buyers who lost their homes in the distress market) are still re-entering the market.Â So it would appear that only economic factors (global and national) would slow the demand side of the equation.Â Although Arizona is not immune to the economic component, it is far less vulnerable than many other states that rely on the price of commodities (energy, etc).Â Therefore we believe the odds favor demand showing up in 2016. No matter the market swings, we will do our best to keep you informed once the trends have been confirmed.Â As always, we are here to answer questions and help you make informed decisions whether buying or selling.